With a strong work ethic and a sense of philanthropic responsibility, Connor Willey knew at a young age that he wanted to make a difference in his Arizona community. He sought opportunities with social entrepreneurs and non-profit startups. 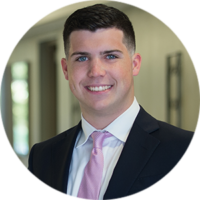 After graduating high school, Connor moved to Omaha, Nebraska to attend Creighton University and earn a degree in financial analysis. Connor started his career as a commercial real estate analyst, underwriting development and investment transactions. He joined PJ Morgan Real Estate in 2017, using his financial background to specialize in residential investments and commercial sales & leasing. His ability to instill trust and provide straightforward solutions to challenging real estate situations generated several million dollars in first-year sales. He strives to serve every client with keen attention to detail and critical timelines. Connor is a member of the Urban Land Institute (ULI) and the Omaha Young Professionals. He attended Brophy College Preparatory in Phoenix and received his BS in Financial Analysis from Creighton University.